In a series of contributions Olderog et al. have formulated and verified safety controllers for a number of lane-maneuvers on multi-lane roads. Their work is characterized by great clarity and elegance partly due to the introduction of a special-purpose Multi-Lane Spatial Logic. 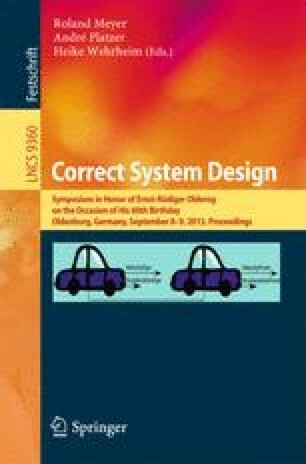 In this paper, we want to illustrate the potential of current model-checking technology for automatic synthesis of optimal yet safe (collision-free) controllers. We demonstrate this potential on an Adaptive Cruise Control problem, being a small part of the overall safety problem considered by Olderog\(^1\). This paper is partially sponsored by the EU FET projects SENSATION and CASSTING as well as the Sino-Danish Basic Research Center IDEA4CPS.